Call Trucks Only Internet Department 602-354-7623 for all the specs and to schedule your test drive! Your buying risks are reduced thanks to a CARFAX BuyBack Guarantee. 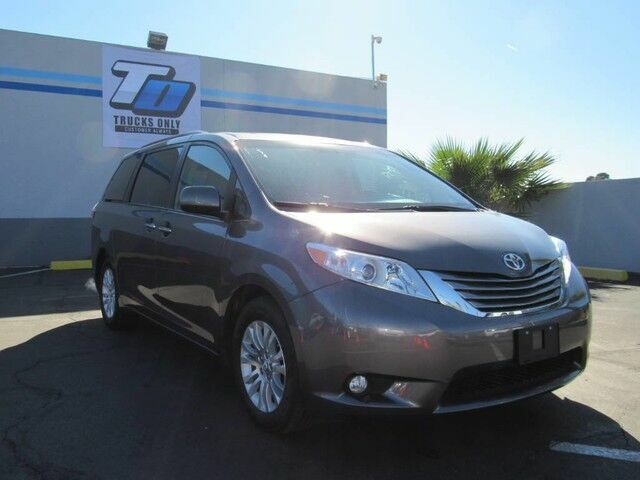 The Sienna XLE Premium is well maintained and has just 30,761mi. This low amount of miles makes this vehicle incomparable to the competition. Most vehicles are equipped to get you and your passengers from A to B in comfort and style. This Toyota Sienna makes that trip more entertaining thanks its premuim entertainment package. Marked by excellent quality and features with unmistakable refined leather interior that added value and class to the Toyota Sienna Pre-owned doesn't have to mean "used." The clean interior of this Toyota Sienna makes it one of the nicest you'll find. Engineered with the latest in technology and features, this vehicle is an automobile lover's dream. More information about the 2017 Toyota Sienna: The minivan segment is a fiercely contested market in which features, pricing and capacities remain extremely competitive. The current Sienna continues be leader with its strong V6, 6-speed automatic transmission and mileage estimates of 25 mpg on the highway. The Sienna distinguishes itself as being the only minivan to offer all-wheel drive as an option as well as seating configurations for up to eight passengers. Even the entry-level L trim includes such comfort options such as keyless entry, 3-zone air conditioning and 10 cup holders. Interesting features of this model are spacious, comfortable interior, fuel economy, V6 power, up to 8-passenger seating, true car-like handling, and Available all-wheel drive First Oil Change on us, with every vehicle purchase. Ask if this vehicle qualifies for our Lifetime Engine Warranty! *Diesel and high performance engines are not applicable. Trucks Only has been in business for over 40 years. Our customers have helped us to earn and maintain the A+ rating with the Better Business Bureau and we have been honored to achieve the Customer Satisfaction Award with DealerRater 3 years in a row! Call Trucks Only Internet Department 602-354-7623 for all the specs and to schedule your test drive! Shipping is available across the United States! Please let us know how we can help you find the right solution for your needs!